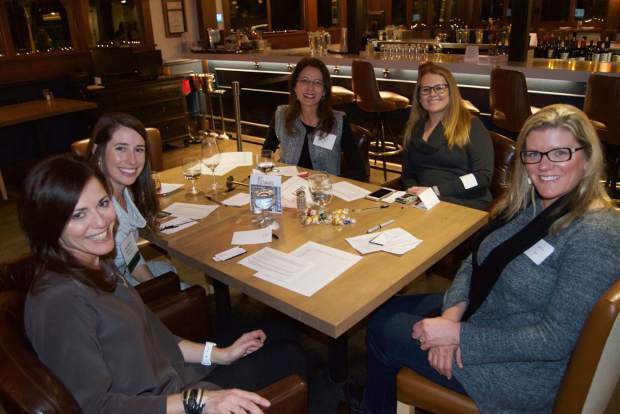 Members of the Vail Valley Business Women gathered at Harvest Restaurant in the Sonnenalp Club for small group networking sessions and socializing. For more information about the group and its mission, visit www.vvbw.org. On a blustery January evening, the strong ladies of the Vail Valley rallied for a networking event at the Sonnenalp Club in Edwards. The Vail Valley Business Women were back at it again for more networking and socializing. The annual “speed networking” event focused on meeting as many professional women to promote business, share leads, find vendors and make new friends. Facilitated networking sets the timid at ease and encourages a community environment. As always, the monthly meeting included dinner. Harvest Restaurant located in the Sonnenalp Club prepared a healthy and delicious fare for the Vail Valley Business Women. There was a simple green salad with tomatoes and cucumbers and Harvest’s homemade preserved lemon dressing, pan seared salmon with roasted vegetables, and Boulder natural chicken. Board member Tricia Swenson welcomed the group. Leslie Grooters had a lovely time with her friends and colleagues. Harvest at the Sonnenalp Club offers live music with Josh McCracken every Thursday and Happy Hour and a Half from 5 to 6:30 p.m. Thursdays to Mondays. Visit http://www.harvestvail.com to view Harvest at Sonnenalp Club’s menu and specials. For more information on the Vail Valley Business Women’s mission, membership and events, visit http://www.vvbw.org.